Ok, so really I do not have a name yet for this quilt. Lines Drawn just popped into my head as I was writing this…so let’s see. I will say, this is probably one of my favorite quilt tops. This quilt top came together fairly quickly while on our mountain vacation this week, a big woohoo for vacations. 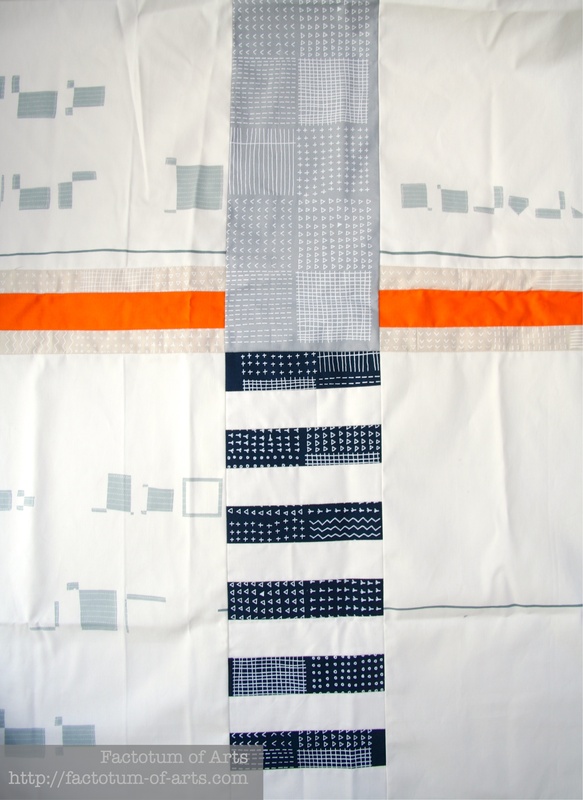 I love the lines, minimalism and complementary nature of the fabrics I choose (love the squares and colors in each). I have been stashing Karen Lewis Textiles fabric and trying to find the right project and decided I just need to do a design specifically for some of my pieces. This was it. 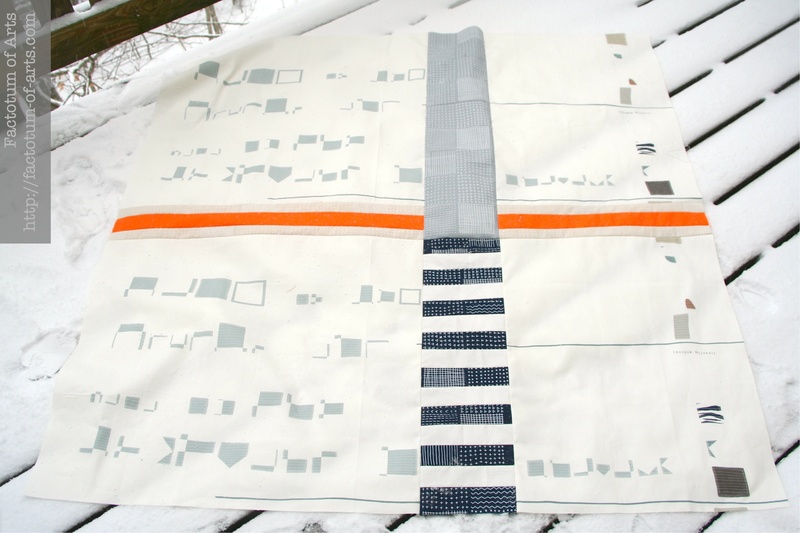 I did play with the colored fabrics I had for a bit and decided on using Allotment in Silver, Oyster and Nautical and Kona Torch (orange stripe). I also knew, once I finished this design that a plain white, or even a white on white fabric was not going to be enough for the background. I wanted something with some interest but not something that took away from the focus of the two lines. I immediately played around with my Yoshiko Jinzenji fabric and decided none of them worked…but there was one I had been looking at that would be perfect…I bought it and thankfully the vision was right on (that does not always happen when I buy fabric for a specific project). If you can think of a better name, I am open to suggestions. Linking up with Amanda Jean @ Crazy Mom Quilts for Finish it up Friday. This entry was posted in Uncategorized and tagged Karen Lewis textiles, Kona Cotton, Yoshiko Jinzenji on January 31, 2015 by mlwilkie. I really liked seeing this top come together as you worked on it via Instagram. The fabrics you used work so well together and really are stunning together. I personally like the name you have given it. I like the balance of the design, the one orange stripe, and yes, the background fabric is perfect. I love the simplicity of this quilt top. I’m curious to see what you make for the back. The pop of orange is striking! Fabulous – I especially like the orange! It kind of reminds me of a map, like an intersection. I really, really like it. Wow! Such a beautiful quilt! 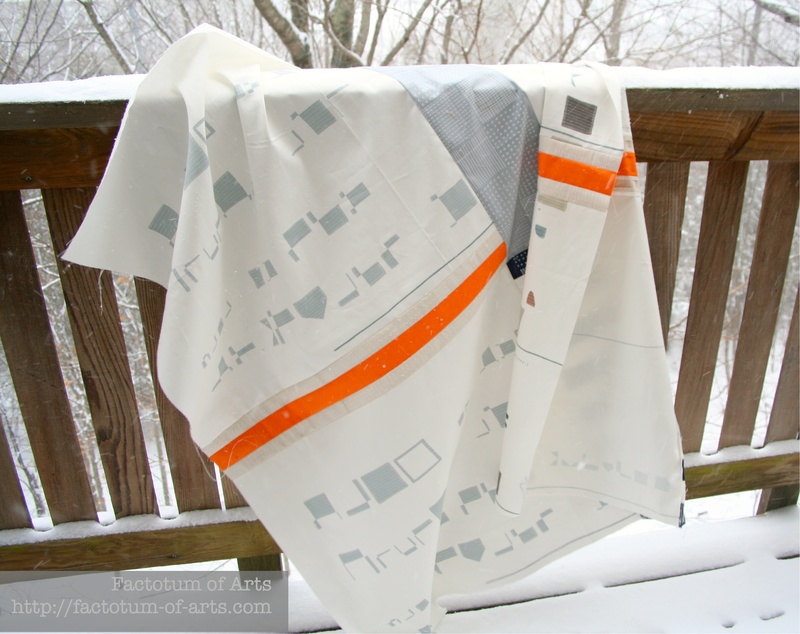 Each fabric works so well as part of the overall design & the orange accent is perfect. 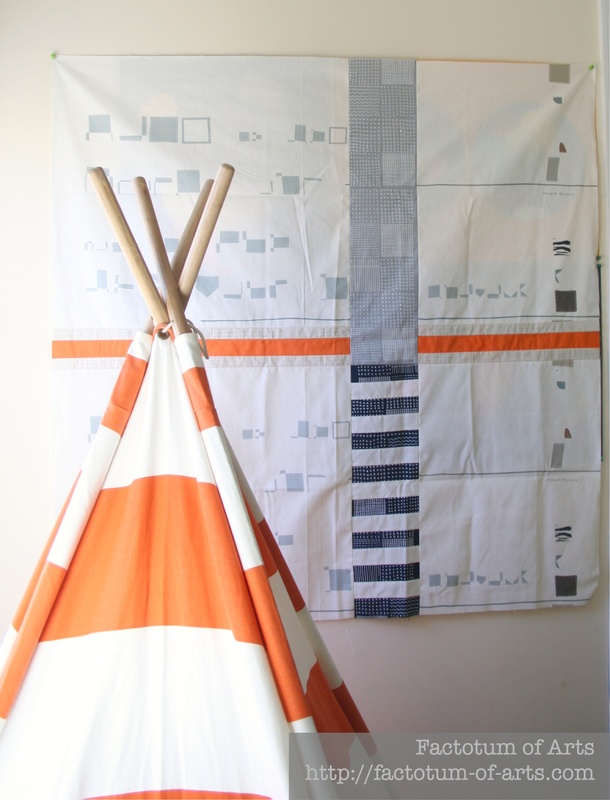 I love that you need to convince your son that this hang in his room – surely that it matches the teepee/tent so well makes it more likely? Love how modern and clean this is. The orange is a perfect addition. This is awesome! I had the same thought as Carol. The first thing that came to mind when I saw this was the word – Intersection. I love the gray and orange. Perfect for a boys room! Beautiful, I love simplicity and design of the quilt. Oh wow – this is so simple but stunning. I love the navy with the orange – what a perfect colour combination! It all works together so nicely! And that teepee posing with it sure fits right in, haha. The design and fabrics are such a great combination. I’m always excited (and impressed) when QDADs become reality but then I realized this was from my spark of the bridge and that makes it even more special. What do you think of “Suspension” as a title?